Experts agree that widespread use of vaccines within the last century has prevented death and disease in millions of animals. Pets, like people, can be protected from some diseases by vaccination. Although this resource provides basic information about vaccinations for your dog or cat, your veterinarian is your best source for advice regarding your pet's vaccination needs. Vaccines are health products that trigger protective immune responses in pets and prepare them to fight future infections from disease-causing agents. Vaccines can lessen the severity of future diseases and certain vaccines can prevent infection altogether. 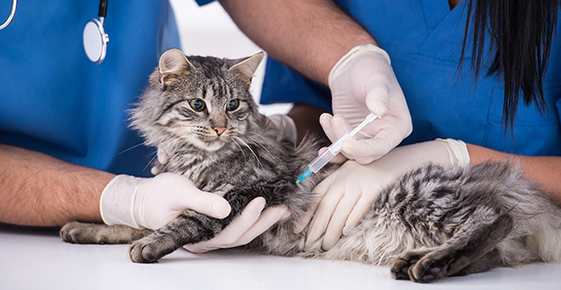 Today, a variety of vaccines are available for use by veterinarians. Is it important to vaccinate? Yes! Pets should be vaccinated to protect them from many highly contagious and deadly diseases. Experts agree that widespread use of vaccines within the last century has prevented death and disease in millions of animals. Even though some formerly common diseases have now become uncommon, vaccination is still highly recommended because these serious disease agents continue to be present in the environment. For most pets, vaccination is effective and will prevent future disease. Occasionally, a vaccinated pet may not develop adequate immunity and, although rare, it is possible for these pets to become ill. It is important to remember that although breakdowns in protection do occur, most successfully vaccinated pets never show signs of disease, making vaccination an important part of your pet's preventive health care. Although most pets respond well to vaccines, like any medical procedure vaccination carries some risk. The most common adverse responses are mild and short-term, including fever, sluggishness, and reduced appetite. Pets may also experience temporary pain or subtle swelling at the site of vaccination. Although most adverse responses will resolve within a day or two, excessive pain, swelling, or listlessness should be discussed with your veterinarian. Rarely, serious adverse responses occur. Contact your veterinarian immediately if your pet has repeated vomiting or diarrhea, whole body itching, difficulty breathing, collapse, or swelling of the face or legs. These signs may indicate an allergic reaction. In very rare instances death can occur. Visit with your veterinarian about the latest information on vaccine safety, including rare adverse responses that may develop weeks or months after vaccination. Remember that while vaccination is not without risk, failure to vaccinate leaves your pet vulnerable to fatal illnesses that are preventable. Why do puppies and kittens require a series of vaccinations? Very young puppies and kittens are highly susceptible to infectious diseases. This is especially true as the natural immunity provided in their mothers' milk gradually wears off. To keep gaps in protection as narrow as possible and to provide optimal protection against disease for the first few months of life, a series of vaccinations are scheduled, usually 3-4 weeks apart. For most puppies and kittens, the final vaccination in the series is administered when they are 12 to 16 weeks old. Which vaccines should my pet receive? Discuss with your veterinarian your pet's lifestyle, access to other animals, and travel to other geographic locations, since these factors affect your pet's risk of exposure to disease. Not all pets should be vaccinated with all vaccines just because these vaccines are available. "Core" vaccines are recommended for most pets in a particular area. "Non-core" vaccines are reserved for pets with unique needs. Your veterinarian will consider your pet's particulars, the diseases at hand, and the application of available vaccines to customize a vaccine recommendation for your pet. How often should my pet be vaccinated? Your veterinarian will tailor a vaccination schedule to suit your pet's needs. For many years, a set of annual vaccinations was considered normal and necessary for dogs and cats. Veterinarians have since learned more about diseases and pets' immune systems, and there is increasing evidence that immunity triggered by some vaccines provides protection beyond one year. The immunity triggered by other vaccines may fail to protect for a full year. More than one successful vaccination schedule is possible. Talk with your veterinarian about what is best for your pet. Many factors are taken into consideration when establishing a pet's vaccination plan. Your veterinarian will tailor a program of vaccinations to help your pet maintain a lifetime of infectious disease protection.